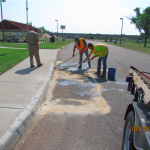 On Tuesday, July 2, 2013, ICA performed pavement preventive maintenance on Collingsworth County Rest Areas with Terra Fog from Terra Pave International. Terra Fog is a special polymer. 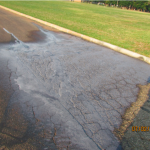 Other materials used include limestone base screenings (dust to 3/8”) and masonry sand. 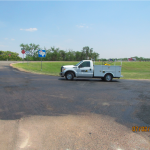 Collingsworth County Rest Area is located on US 83 approximately 37 miles North of Childress Texas. 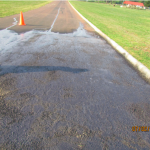 It includes approximately 1450 feet of roads from 21’‐35’ wide. 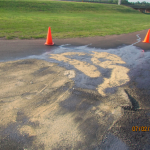 There were a number of previous repairs that appear to be hot mix asphalt pavement probably 10 years old or older. 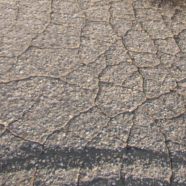 Some of the old repairs are substantially alligator cracked. 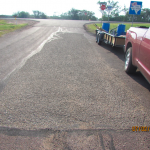 Click below to view a report on the pavement repairs conducted in the Collingsworth County Rest Area using Terra Fog.